Sticked flaky things, which are in places on the surface, are described as scab. They usually only have connection to the basic material in a place. 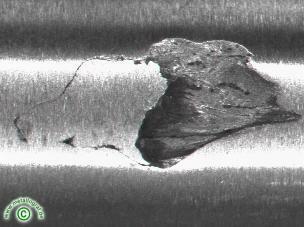 Scabs can appear as a pre-material defect of the billet or block or they can arise from local pincher at the hot forming. In most cases a metallographic specimen examination can give information about the origin of the scabs. In this case it is defects of the pre-material. At the microsections non metallic oxide slags and an anomaly of the sulfides were stated in the environment of the scabs. On the other hand, the scab consists of another material.